It’s the “Medical Surgical Supplies and Devices” line item that’s throwing things out of whack here. Perhaps the insurance company assumes that you would install the replacement hip joint that’s on clearance this week, while your surgeon specced the top-of-the-line model. Or maybe there’s a mistake. I remember having to have my baby girl have a blood test when she was 2 months old, and the hospital claimed that the vial used to collect the blood cost thousands of dollars. I told them that if that was true, I hoped that thy kept those vials in a safe. In the end, it was a clerical mistake. 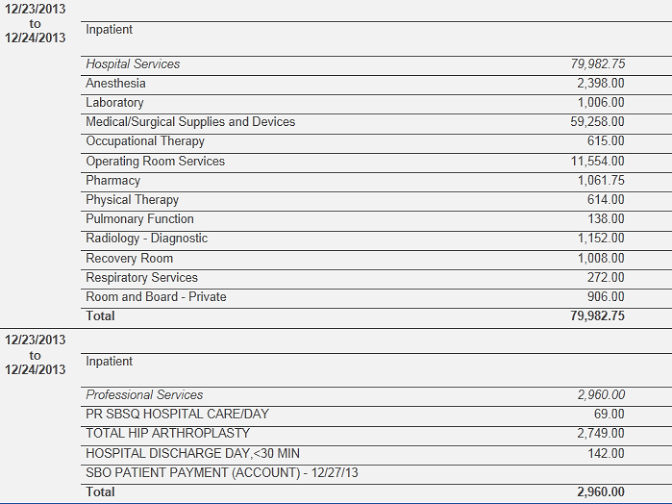 I know that ceramic hips cost more but I didn’t think it would cost almost twice as much as the estimated cost of the surgery itself!!! Itemized lists, can’t wait for the final detail!! !